Thanks to James Cameron, 3D is here to stay as Sony plans to introduce the first 3D-ready Blu-Ray player this March. 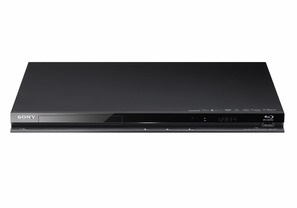 The new Blu-Ray player, model #BDP-S470, is fairly high-tech device. It will show movies at HD 1080p, of course, but will also connect to the web through Wi-fi and display multimedia presentations via USB. You can also download an app for your iPhone or iTouch for the device to act as remote control for the BDP-S470. will be able to stream movies from the web via services like Netflix and Youtube. Oh, and it will show images with extra depth without any help, but glasses are needed for true 3D movies, including graphical menus and subtitles. The BDP-S470 is due out "next month," and will retail for around $200. There will also be upgrades to the home theater systems and a beefier standalone player with noise cancelling tech, the BDP-S570. The only problem is that all of these players won't be truly 3D capable until a firmware update is pushed out this Summer. "Consumer excitement for 3D is unbelievably high and Sony is poised to deliver the best possible in-home experience," said Chris Fawcett from Sony in a statement. "Involved in every facet of the 3D chain from professional equipment to content production and hardware, Sony is the one company that can lean on its broad expertise to deliver 3D to the home that truly captures consumer imagination." I'm kind of "Meh" on the topic of 3D but it appears it is the direction that the rest of the world is going. Sony mentioned at this year's Consumer Electronics Show that the PlayStation 3 would get an update to allow 3D but there's no indication if the console will be involved in the firmware update this summer. The [new] models also offer improved start up and disc loading performance. When the quick start feature is turned on, the start-up time is quicker and disc loading is faster than previous models. The stand-alone Blu-ray Disc players can start-up from power off in about three seconds. Thank the maker! I hate waiting 20+ seconds for my Blu-Ray player to power up.